Why the British establishment wanted to gag the press? You think they really give a damn about your privacy being invaded? Where are the Health & Safety Hitler’s when you need them? You can’t sell a home made pot of jam or home-baked cake, but in the construction industry where there is a real risk of fatal and maiming accidents, Health & Safety appear to be an optional extra. Not to mention blacklisting of Trade Union Health and Safety representatives. ‘ It just doesn’t compute. Almost every day the news is filled with stories that look to me like corruption. 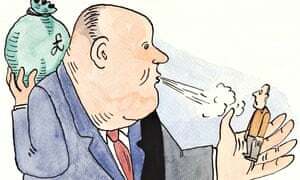 Yet on Transparency International’s corruption index Britain is ranked 14th out of 177 nations, suggesting that it’s one of the best-run nations on Earth. Either all but 13 countries are spectacularly corrupt or there’s something wrong with the index. Yes, it’s the index. The definitions of corruption on which it draws are narrow and selective. Common practices in the rich nations that could reasonably be labelled corrupt are excluded; common practices in the poor nations are emphasised.